Next, I'd like to talk about the structure and design of Wii. Takamoto-san, please explain to us what you were responsible for. 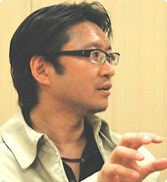 I was responsible for developing the structures of the system and the controller. More specifically, the things inside the device, such as the drive unit, the metallic parts and connectors of the shield casing, as well as other exterior plastics. In other words, I was responsible for the design of all the main components other than the circuit boards. Wii certainly stands out in comparison with the other game consoles that are available. Firstly, it's by far the smallest. Tell us a bit about this. I actually stacked up a few DVD cases and said, "I'd like to make it about this size!" (laughs) I guess this must have come as a shock to you? "Well, I was more stumped than shocked! (laughs) When we first started developing Wii I was somewhat dubious as to why we needed to make it so small, but I came to understand this vision as development progressed. That is to say, I came to realise that Wii should be inconspicuous when placed around the living room TV. As you know, TVs always have a lot of AV equipment packed around them. With the GameCube, the console itself had to be taken out and placed in front of the TV because of the cables leading from the controllers. Wii, on the other hand, is wireless. The very nature of the Wii Remote means that the user will have to place the console near their TV. Of course, this imposes physical limitations on how big the device can be. We envisioned that it might be placed in a narrow space beside the TV, or in a tight space on top of some other equipment. We really felt that we had no choice other than to accomplish our goal of making Wii fit in this space. In the end, it was impossible to make it the size of 2 DVD cases, but we did somehow manage to make it as thick as 3 DVD cases. (laughs)"
I know it was my suggestion, but it wasn't an easy hurdle to overcome, was it? Tell us about some of the problems you encountered. One particular problem was the disc drive. As I'm sure you can imagine, once the space needed for the casing and other components has been taken into account, the drive unit itself can be no thicker than a single DVD case. This was a real challenge. And of course, if you make it too thin, then the issue of robustness comes into play. At the end of the day, no matter how powerful Wii is, it's still used for playing, so we have to assume that it will also be used by children. Of course, Nintendo has particularly stringent standards to ensure that our products don't break easily! (laughs) So, we carried out test after test in order to strike the perfect balance between size and strength, failing again, and again, and again... Thanks to this process of trial and error, we were finally able to achieve a thickness of 3 DVD cases by inserting some reinforcing plates. The need to make Wii both small and strong was, fundamentally, a contradictory proposition. What other problems did you face in addition to making the console small? As well as striving to make Wii as small as possible, we were also particularly keen to use a slot-loading disc drive. Using a drive with a lid, like the GameCube's, would have saved a few millimetres. In addition, slot-loading drives are expensive and their durability is a cause for concern when compared against drives that actually open. But again, we had to take into consideration where the console might be placed. Given that TVs nowadays have very little extra space around them, and given that a slot-loading drive allows for more compact access, it was an absolutely indispensable feature when thinking about our customers. Based on the kind of lifestyle our customers lead, and due to the fact that our controllers are wireless, I think we made the right decision. 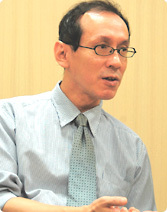 So, let's talk to Mr Ashida next. Ashida-san, please tell us what you were responsible for. Certainly. I was in charge of the actual design of the console and the controller, as well as that of the packaging and logos. You've been responsible for designing Nintendo hardware since the SNES. What did you focus on when designing the Wii? I first asked a lot of employees for their opinions regarding the hardware. This goes back to what Takamoto-san said earlier, we really wanted to avoid causing any more clutter around the TV, in terms of shape as well as size. For example, the Nintendo 64 can only fit in a limited number of places because of its many curved faces. One of our major design goals, therefore, was to create a device that can be placed anywhere. That said, many people felt that the GameCube was designed like a toy. We realised this, of course, but all Nintendo hardware since the SNES had been designed with that explicit image in mind. It's not that we ignored how AV equipment was designed. Rather, we placed more emphasis on designing our hardware with entertainment in mind. Now, however, the age range of our users is changing, so I felt that we had to strike a balance between designing it as a toy and designing it as a piece of AV equipment. Again, these are two contradictory propositions. What was the turning point in Wii's design process? Our direction was firmly decided when we hit upon the idea of combining the system with the stand. Our initial target was to make Wii the size of 2 or 3 stacked DVD cases. With this target in mind, it was only natural that the console became rectangular in design. We would have reached a design dead end if that had been our only vision. I mean, it's only rectangular! (laughs) Fortunately, our young designers came up with the stand. 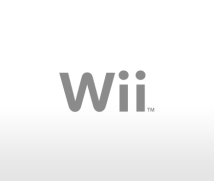 By combining this with the Wii itself, we realised that we could achieve a number of new expressions, even if Wii itself is simply rectangular in appearance. The way that Wii is perceived would be very different if it wasn't for the stand, right? Yes. The console alone can be placed either upright or on its side. By combining it with the stand however, it presents itself in an entirely new manner, with the Wii fitting snugly into the stand. To tell you the truth, the combined Wii and stand design was finalised only a few weeks before the device was presented at E3. I remember what happened when you first showed me the design. I gave it an instant thumbs-up, didn't I? Yes. (laughs) We showcased it to the world soon after at E3. Since I was still designing the inner workings at the time, I was very surprised!